Concord's most distinguished crew member, "JETER". He prefers to be called "Jeter" pronounced G-ter. He's not much for first names! Jeter holds the record for the longest continuous service aboard AFS-5! He reported aboard in 1972 as a Fireman Recruit!. He was aboard for 13 years in1985! 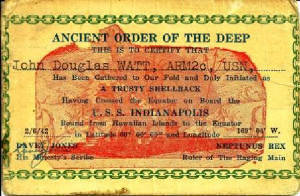 He left kicking and screaming(after being forced by Washington) as a Chief Petty Officer! I'm sure there is no one alive who knows more about the ship, her crew, and certainly that boiler room! 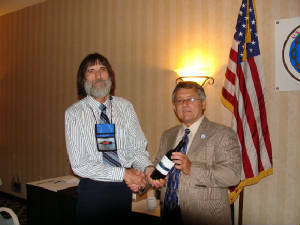 Here, he is presented a commemorative bottle of wine in recognition of his historic service! Well Done Jeter! The ships bell on naval vessels has much heritage and history. Legend has it that the Cook shined the bell daily and the boatswain made the first pot of coffee each morning. A tradition that I personally witnessed was baptisms conducted on our ship (Concord) performed by the ship's chaplain and witnessed by the babies parents and select crew members. As a young Hull Technician I was tasked with taking the bell from its bracket, turning it upside down and positioning it inside a holder which was dressed with decorative bunting. The baby was then placed inside the bell and the chaplain sprinkled the child and said a blessing. Once the ceremony was over, the bell was engraved (using a letter punch set) imprinting the child's name and date of baptism. It was this event that sparked my desire to locate our ships bell, and try and locate the babies and families and tell their story to our members. After much writing back and forth to the Navy History Heritage Command the bell was located. Unfortunately the bell was polished so well that the names have been removed. If you had a child that was baptised in this bell I would like to hear from you. Regardless the bell has been located and you can go visit it and touch the only available piece of ships history (other than the ships minuteman statue) available. Below is the physical address, and the organization which helped locate our bell. Zoe's "Shell back stuff from yesteryear.........ARRG! I received the below pictures from a fellow American, Zoe, who had them in his family and wanted to know if I had any information about them. The second photo below, which is the "USS Concord Shell Back initiation from the early 1900s" was the first that he sent, and it is an early Concord picture which I found very nice and interesting. Click on the photo and take a good look at how a real initiation was conducted back in the day. The following is the email that Zoe sent, and if anyone has info to add to this or the below Shell back card send them along to me "webmaster" and I'll forward to Zoe. 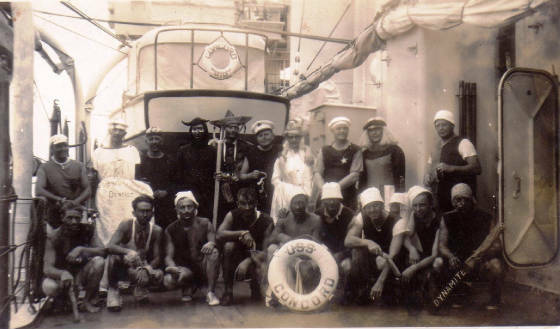 "The men in my family have a long Naval tradition (Grampa was a Pearl survivor). Recently I came across this old photo. I'm hoping you can tell me if this is USS Concord and when it might have been taken. It looks to be some kind of prank on a group of sailors crossing the equator for the 1st time. I know it would be asking too much to find out if there is a Watt, Wickerd, or Slocum in this photo". Click here to see CONCORD'S 35th anniversary celebration. Concord vet makes Admiral. Check it out! Did you know that a CONCORD vet played in the NFL and also helped the Giants win the 86 Super Bowl? Click here to read about Phil McConkey. Phil was a LTJG in HC-6 and deployed to the Mediterranean in 1982. Way to go Phil!! Are you a RTC Orlando or San Diego boot camp graduate? Click here to see those areas today! Warning - You will be shocked!